Dr. Mohamed Ibrahim announced the discovery of a number of Greco-Roman tombs at Gabbari necropolis in Alexandria. 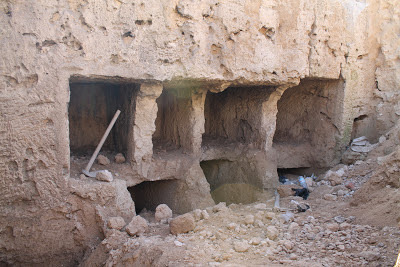 The tombs were discovered during soil tests by antiquities inspectors before construction work starts at the site. The tombs are 2 levels burial cavities, the lower level were submerged under the underground water. The necropolis knows as “City of the dead” was discovered during bridge construction in the western part of the city where over 40 tombs were found in the 20th Century. Dr. Mohamed Mostafa, director of Alexandria Antiquities, said that the discovered tombs are a part of the western cemetery which was devoted to bury the public neither non-royal nor non-officials. He also referred that no remains of mummies, skeletons or pottery were found in these tombs so far.